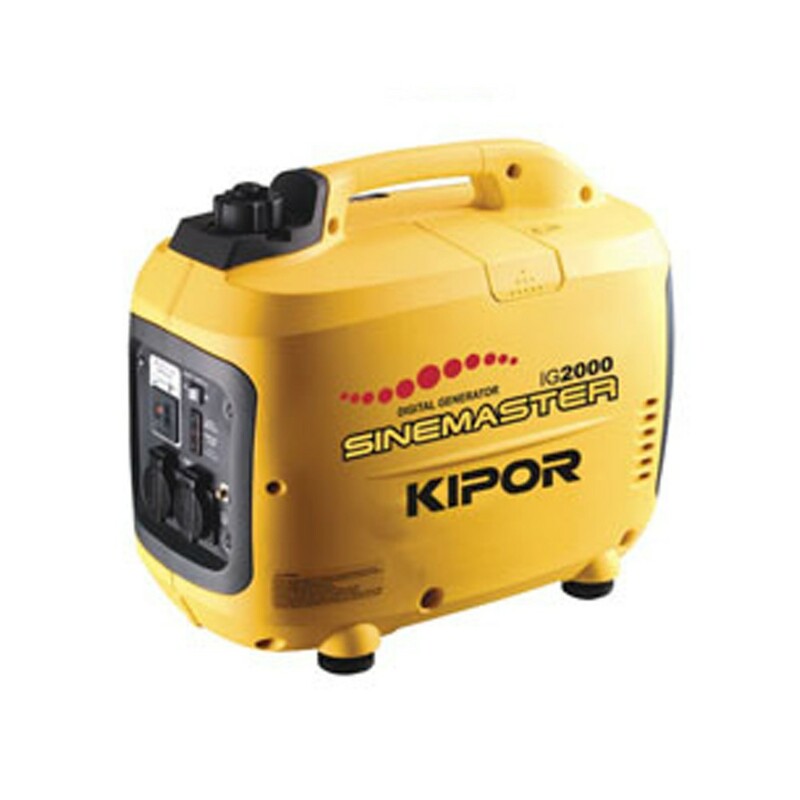 Kipor Generators — The Shop Industrial inc.
We carry a line of affordable and portable Kipor generators. 120V Super Quiet 54-59db. Quiet and lightweight, the IG1000P lets you bring an outdoor power source to wherever you need it. It can run a radio/DVD player, television, computer, small coffee maker, electric drill or lights. You can even add a 500 watt mobile light kit. Parallel ready. 120V Super Quiet 54-59db. The IG2000P gives you more power with a compact portable design. It can run a small refrigerator or microwave oven, electric skillet or a portable heater. A powerful 500 watt mobile spotlight is available as well. Parallel ready. The IG2600HP comes standard as a parallel version. The convenient retractable wheel and handle kit make it very easy to transport and move. With a 2300 watt run load, it is able to provide steady clean power to operate a number of different appliances and tools. Two IG2600HP models can be connected to provide 5200 watts of power with an optional parallel kit. The rugged design of the Kipor Professional Series IG3000E generator gives you the dependability you need on the job site. It’s ideal for rental, construction and industrial applications. Even better, the IG3000E also has inverter technology that produces a pure sine wave suitable for powering sophisticated electronic equipment. The IG3000 handles large power needs. Run a 13,500 BTU air conditioner or a 1.2 HP air compressor or an automatic washer. It comes with an electric starter and a maintenance free battery. The standard wheel kit with locking swivel wheels makes it extremely easy to move. The low noise makes it acceptable in any campground and it can run eight hours at a full load on a single tank of gasoline. It features a 120V 20A duplex and a 30 amp twist lock receptacle. Diesel engine technology provides up to 5000w max load. This generator has two 120V/20A receptacles, one 120V/30A twist lock receptacle and one 240V/50A receptacle. Recoil and electric key start for easy use, the KDE5000E also features an electronic ignition, circuit breaker, fuel gauge, voltage meter and a low oil level shutdown system. This generator is designed for easy transporting and easy storage. With a full load potential of 4000 watts, it can easily run a number of appliances simultaneously with the same high quality and clean power. Dual 120V and 240V capability enable it to run all types of appliances and tools. The 277cc engine and larger alternator will start and run most air conditioners without start capacitors. The IG4300 also features a digital panel displaying voltage, amps and frequency along with a duplex GFCI receptacle.